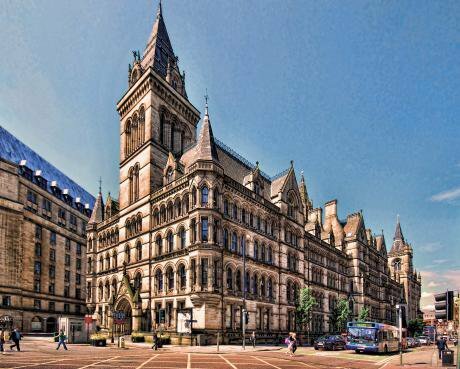 Image: Manchester Town Hall, Credit: Wikimedia Commons. So James Wharton, the Northern Powerhouse minister, has been caught avoiding the north. No doubt he’ll be back up north again like a shot. It was on the cards anyway, as Theresa May reached for it recently, putting it back on the agenda. Theresa May's recent reaffirmation of the Northern Powerhouse agenda (a term coined by George Osborne and then fully endorsed by his disaster twin Cameron) is unsurprising. The government is running on empty and the North is an easy thing to reach for. The Tories have long seen it as a backwards space to be tamed and profited from. Theresa May explained to business people in New York a couple of days ago that this country will have the lowest corporation tax of all the developed countries after it leaves the EU: The lowest business rate in the G20. So now we know. Ironically, early industrialism was fought by many Conservative parliamentarians as it developed in the late eighteenth and early nineteenth century: The upstart industrialism often ran counter to their own interests in agriculture and business – though a few (like the Lords of Bute) were shrewd enough to see the game changing. After escaping from this summer’s febrile parliament to the North, Theresa May’s next stop was Africa, to coax trade deals. In the nineteenth century, the East End of London was seen as 'darkest London', a local exotic counterpart to 'darkest Africa', and the north was described using similar terms of imperialist eugenics. But May's new imperialism was a desperate attempt, and her ritual dance a perfect expression of it. The Northern Powerhouse has been rolled out and back in again over the last few years. I have covered some of those earlier moments here. But May's latest use of Northern Powerhouse is not a restatement, but an entirely new, Brexit-inspired version. As Jennifer Williams of the Manchester Evening News journalist sets out in the Guardian, the Tories talk of Northern Powerhouse whilst “simultaneously shredding local services in the region”. Williams adds that the “north desperately needed a functioning infrastructure” – meanwhile Osborne is back in London and the rail system around Manchester has buckled. But it’s not all about trains. In fact, the problem with the Powerhouse vision of Osborne and Sir Richard Leese, head of Manchester City Council, is that all they ever think about is trains. They must have magnificent train sets in their attics. Williams cites Osborne's original Powerhouse speech. He described the north as “a deep pool of human capital”. The word Williams doesn't use is “exploitation”. The craniologist's calipers are back out again when the north is viewed as a land of idle labourers. Let’s remind ourselves of a short history of The Northern Powerhouse myth. Osborne and Cameron announced, tellingly, it at the Museum of Science and Industry. The myth also encompassed, in its bootstrapping logic, the 'Big Society’ trope. The Northern Powerhouse then vanished for a while, and the government notoriously closed the Northern Powerhouse office in Sheffield and shifted its 247 jobs to London. So what does May’s reaffirmation of the Northern Powerhouse really mean now, in the light of Brexit? Business, eventually disabused of their legal obligation to EU worker rights, will see 'the north' as a place to cream surplus. Northern workers will have to resist or face another hundred years of laissez faire. It’s a tricky one – there will be a temptation to rebel using the cultural rhetoric of indigenousness. North-south resentment always lurks below the surface. We need to resist it, in favour of an outward-looking global rhetoric. The past must be called upon. Not only the past of industrialism, which the rhetoric of The Northern Powerhouse itself pulls us into, but earlier pasts such as the Highland Clearances, which were not restricted to the Highlands, nor to Scotland. What we are seeing now is the equivalent to the clearances of the 18th and 19th centuries: London swells to bursting and is lanced by social cleansing programmes. Herds move 'up north' like revanchist nomads, looking for cheaper property and the dream of a middle-class life – and in doing so inadvertently dislodge those already in place. The numbers of homeless swell – not only addicts and those with mental health issues, but workers now living in tents, cars and vans. Chefs and security guards. These are the urban clearances that parallel the highland clearances. It would be very easy to use the term 'disinherit' here. To see these incomers from a south dying under its own distributive system as disinheriting those already in the north. This must be resisted too. I am for a future in which individuals do not inherit, but all of the people do. Landlordism must be given no sympathy. The unleashed algorithm of capital is largely what carries those clearances out, destroying the lives of masses of people. Are YOU a “deep pool of human capital”? Manchester capitalism is one of the prototypical algorithms the 'developed' world now uses. Stocks of real goods, cloth, printed fabrics in warehouses, became abstract numbers for those in the Exchange in Manchester, as Engels observed, from inside the machinery of the Ermine and Engels works. Those who worked the cloth were referred to as ‘hands’ – mere objects, comparable to those bales of cloth. And they still are when, Osborne describes you and your family as a “deep pool of human capital”. Theresa May’s Northern Powerhouse is Northern Powerhouse 2.0. Eventually unhooked from EU regulations, capitalism is not going to get easier to deal with. When the EU ceases to be the last stop along the line to overturn injustice, the task will by default fall to our domestic parliament and courts. But geographically closer than Brussels does not mean these institutions will be more accessible, more benign, more open to your sorry stories. The referendum on EU membership was a referendum on the organisation of space, when what was needed, and what is still needed, is a referendum on the organisation of time. We need more disruption of the Brexit sort, not less. We need a new constitution, an entirely new social contract. But what we are going to get is a return to the eighteenth century: Here, industry is a marginal affair amongst a great deal of poverty, and a narrow elite who run things simply because they know how to. Manchester’s Peterloo massacre led on to the police state of the nineteenth century – and again like the rest of Manchester capitalism, influenced the whole world to do similar things. These are the histories we need to return to in order to understand the future. In 2010, Millbank, and 2011 across England, rioting was met by the Benthamite surveillant logic and hard, punitive, kettling and coshing. A grim force, applied to the children of England, including the poorest. Responses that fall shy of the full revolutionary ambition are now pointless. Localism is often proffered up as the magic solution, at which point it is assumed that conviviality will burst from the surface of even the most depressed area. It’s a confused, strangling weed of a solution. Back in the nineteenth century, the earliest forms of welfare were locally administered, and they were morally policed, grim and corrupt. The un-localising of the welfare state was a very great thing, but most people don't understand this. The bunting and flags get in the way. This horrific intellectual confusion of 'the indigenous' and the return to a smaller scale is now disturbingly present in both left- and right-wing discourse. On the right, the urge can be seen as a sometimes-violent antipathy towards the incomer and the non-white or non-western subject. On the left it is a drippy utopianism about a local community filled with pushchairs and punch bowls. These two visions look awkwardly at each other, often across the fence of class. But philosophically they are perfect companions. This turn inward, this turn towards smaller units of governance as an a priori good, must be rejected. It could only benefit Theresa May – and Osborne and Cameron, coming back the other way, their heads hung, not in shame, but only so that they don't make eye contact with a public they have little interest in. All three are the champions of The New Monster that is coming. Do we have the tools to fight The New Monster? The clearances saw the final breakup of the clan system. Culloden is sometime described as 'the last pitched battle in Britain'. It was not, there were food riots in the nineteenth century and the battle at the Orgreave Coking Plant and there were the riots across Britain in 1981. There were the Poll Tax Riots and there was 2010 and 2011. These are the pitched battles of our time. They might not get the sabres out for the charge any more, but they will mess you up just as badly, in the racist nick, in punitive expulsion from welfare, and in prison. The clearances were fought by people who owned broadswords on one side, trying to hold back the explosion of ‘modernity’. Similarly, the current assault is being opposed by trade union rhetoric still drawn from the resources of nineteenth century industrialism – the strike and the ballot. These are all still essential tools, but The New Monster that is coming will require the invention of entirely new weapons, or it will rule us for a thousand years and eat those who it cannot. This is the mental switch that needs to be made. I am permanently alarmed by my students, who seem to drift by in a glaze of images, a beautiful summer stream of pictures of their world, in place of any harder view of it. This watery permanesia is not a good indication that the younger generations are working on new weapons with which to fight The New Monster. Of course, The Monster needs to make just enough of them feel like this vision of their lives is real, beamed back at them by the other inhabitants of the permanent hallucination. But The Monster is struggling to do so. The stakes have been raised, no longer will 'enough to eat' cut it: This is how Northern Powerhouse 2.0 will struggle. You see, even The Monster of Northern Powerhouse 2.0 has problems. Let us attack it precisely at its weakest points.